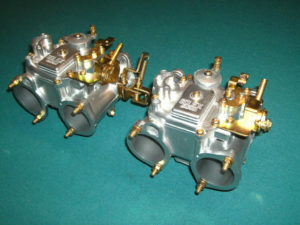 We offer Weber Carburetor & Solex full rebuilding & restoration. From Vintage to the modern manufactured models. Carbs all get fully disassembled, all parts cleaned in an ultrasonic cleaner, Alloy parts (bodies, covers, chokes, venturies get MIcro-polished to return the finish to like new or better). All Carbon steel parts get stripped and correctly replated. 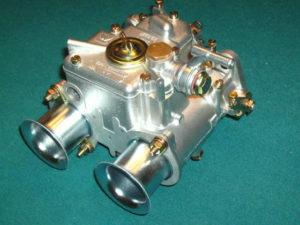 Carbs are assembled with new parts depending on the wear: throttle shafts, bearings, throttle valves (butterflies), accerator pump ect plus all new gaskets & seals are installed. We can do mixture changes i.e main jet, idle jet, pump jet, emulsion tube ect. 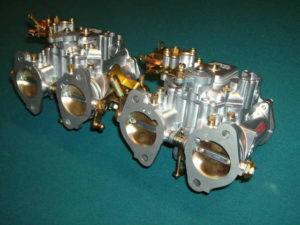 Carbs get bench tested on a carb flow bench for leaks & air/fuel delivery. All rebuilds have a one year warranty.